The DOUBLE SAFETY HEAD TRAILER's bright white translucent roofs supply plenty of natural light inside. 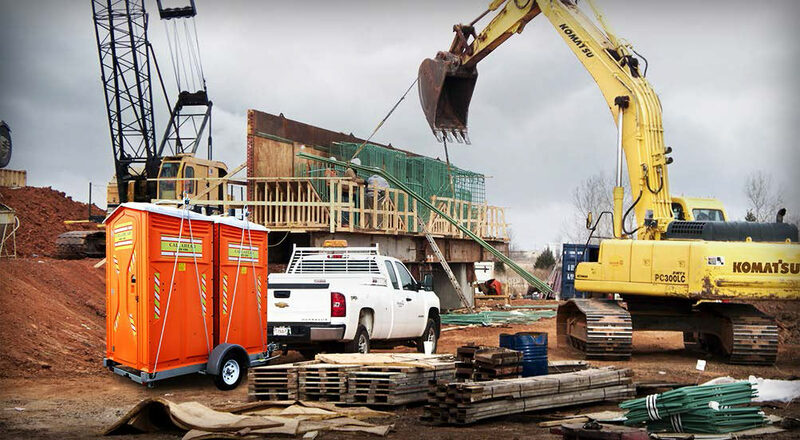 The DOUBLE SAFETY HEAD TRAILER is perfect for major highway construction sites since it allows job site restrooms to follow the construction crew. 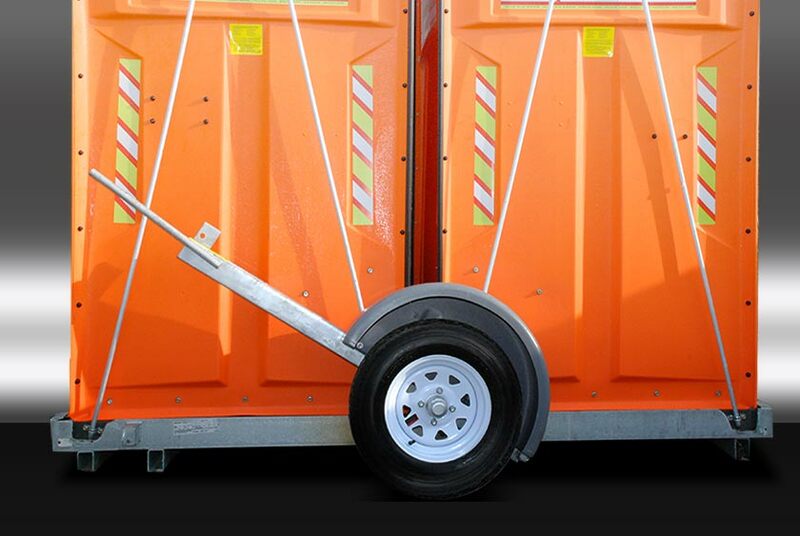 Once you transport to your desired location, the DOUBLE SAFETY HEAD TRAILER easily lowers your porta ble toilets to ground level for stable and easy access for all to use. When your job site is ready to move again, quickly crank the DOUBLE SAFETY HEAD TRAILER to lift the portable toilets to follow the construction crew to the next job site location. Another benefit, the DOUBLE SAFETY HEAD TRAILER moves just as easy when full. New York Airports are another popular rental location for the DOUBLE SAFETY HEAD TRAILER where security and safety are of the highest priority. 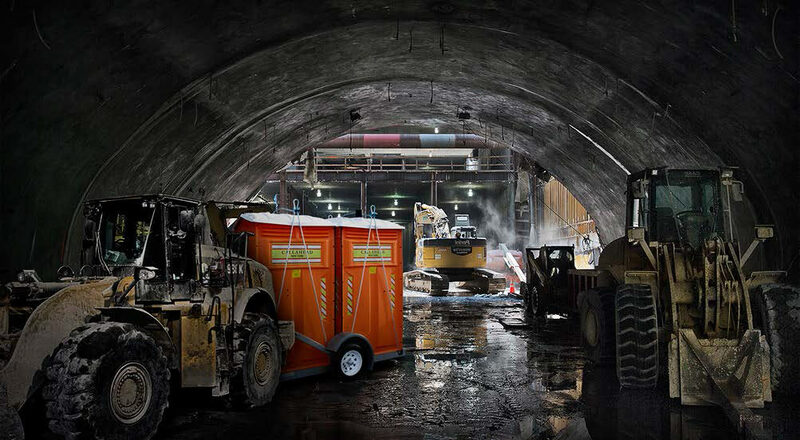 Its fluorescent orange color and reflective design provide clean restrooms and vital job site safety for nighttime construction sites. The DOUBLE SAFETY HEAD TRAILER will deliver the highest value for its rental. All of CALLAHEAD's portable toilets arrive at the job site in like new condition. The DOUBLE SAFETY HEAD TRAILER rental comes with CALLAHEAD's renowned cleaning service. 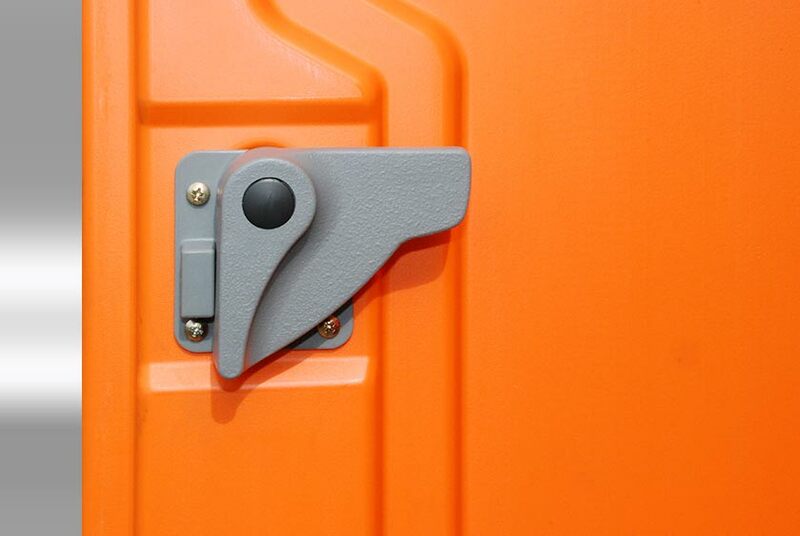 Each portable toilet will be cleaned and sanitized with by a uniformed service technician using only hospital grade cleaners and disinfectants. 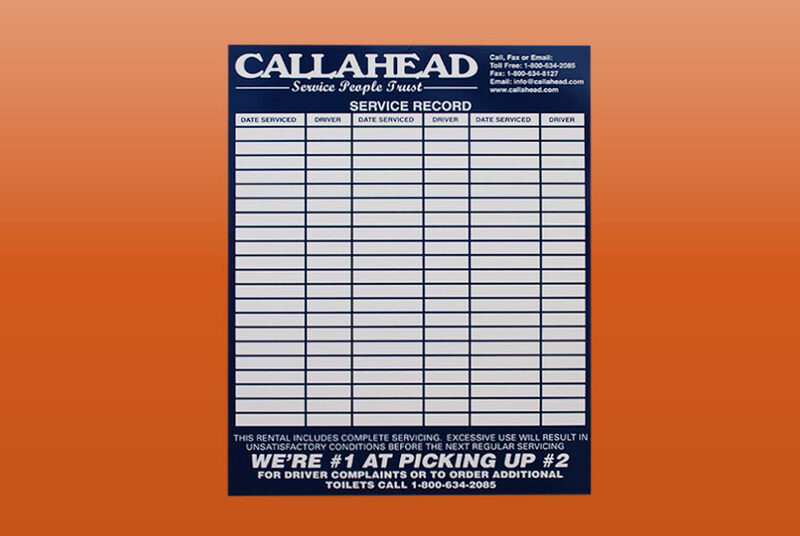 Installed in every porta potty is CALLAHEAD's sign in sheet which is signed and dated at each cleaning service. 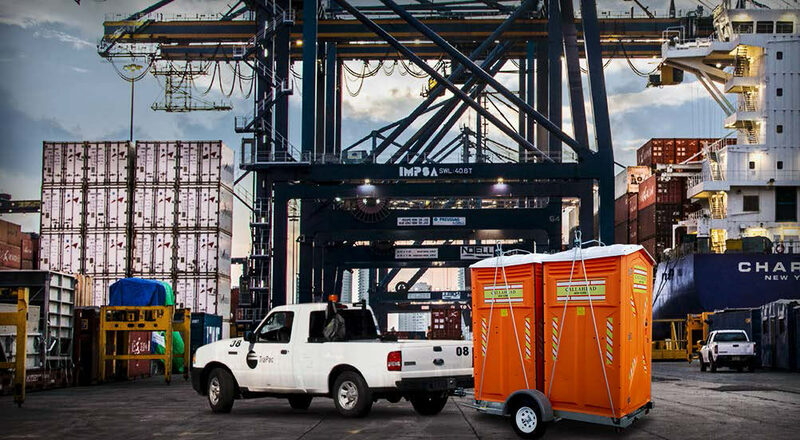 The DOUBLE SAFETY HEAD TRAILER will provide the greatest portable toilet service with mobility and the invaluable addition of job site safety. The DOUBLE SAFETY HEAD TRAILER is available for same-day delivery to New York City's five boroughs of Manhattan, Brooklyn, Queens, Bronx and Staten Island, Westchester County and all of Long Island's Nassau and Suffolk Counties to Montauk Point. For added convenience, we are proud to offer the below list of optional accessory items with your DOUBLE SAFETY HEAD TRAILER rental. 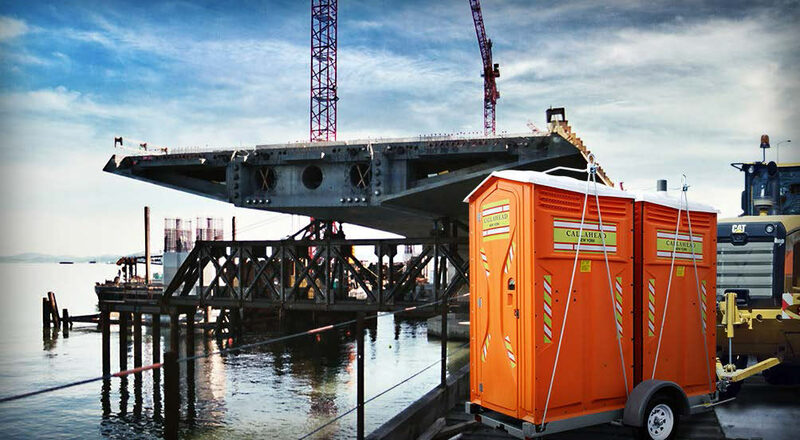 All of CALLAHEAD's rental accessories for portable toilets were selected to give construction workers and contractors the same comforts and hygienic protection as if they were using an indoor restroom. 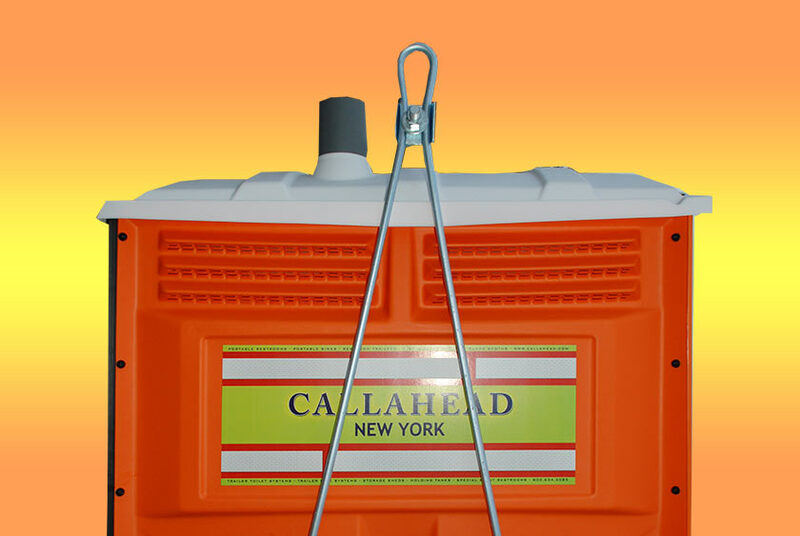 CALLAHEAD's portable restroom accessory items are unmatched in the portable toilet industry and include: Antiseptic Dispenser is installed inside your DOUBLE SAFETY HEAD TRAILER filled with our waterless hand sanitizer. Our waterless hand sanitizer kills 99.9% of germs and bacteria and meets OSHA and Health Department requirements. The antiseptic dispenser is perfect for sanitary protection before and after using a porta potty. The antiseptic dispenser supplies approximately 900 - 1300 applications and is 100% maintained and refilled when needed by CALLAHEAD with its rental • GoJo Hand Cleaning Dispenser can be installed inside the DOUBLE SAFETY HEAD TRAILER and filled with the #1 heavy duty GoJo hand cleaner. GoJo hand cleaner is popular among auto mechanics for its ability to quickly break down grease and grime. GoJo Hand Cleaner has become popular with construction workers and contractors to remove acids, cement and other solvents from hands. 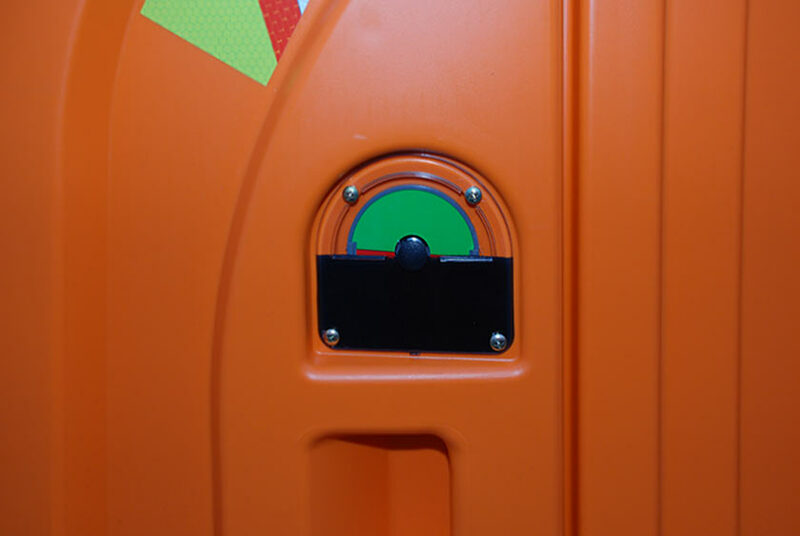 100% maintained and refilled when needed by CALLAHEAD with its rental • Paper Towel Dispenser can be installed inside your DOUBLE SAFETY HEAD TRAILER rental and filled with 250 sheets of double fold paper towels. The Paper Towel Dispenser is most commonly rented with the Antiseptic Dispenser or Go Jo Hand Cleaner to clean off any dirt or solvents that are otherwise hard to remove. 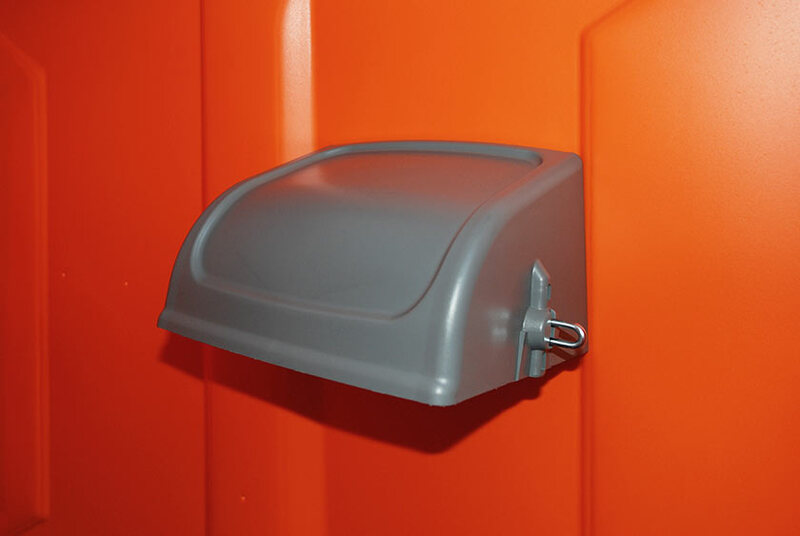 Paper Towel Dispenser is maintained and refilled 100% by CALLAHEAD with its rental • Headliner Toilet Seat Cover Dispenser can be installed inside the DOUBLE SAFETY HEAD TRAILER filled with 250 toilet seat covers so every user may have a clean, dry and sanitary toilet seat. Headliners are refilled when needed and 100% maintained by CALLAHEAD when rented • Headmist Time Released Air Freshener can be installed inside the DOUBLE SAFETY HEAD TRAILER that will release a clean fresh scent automatically. The Headmist is refilled when needed and 100% maintained by CALLAHEAD with its rental • The following is the detailed design specifications for the DOUBLE SAFETY HEAD TRAILER rental. 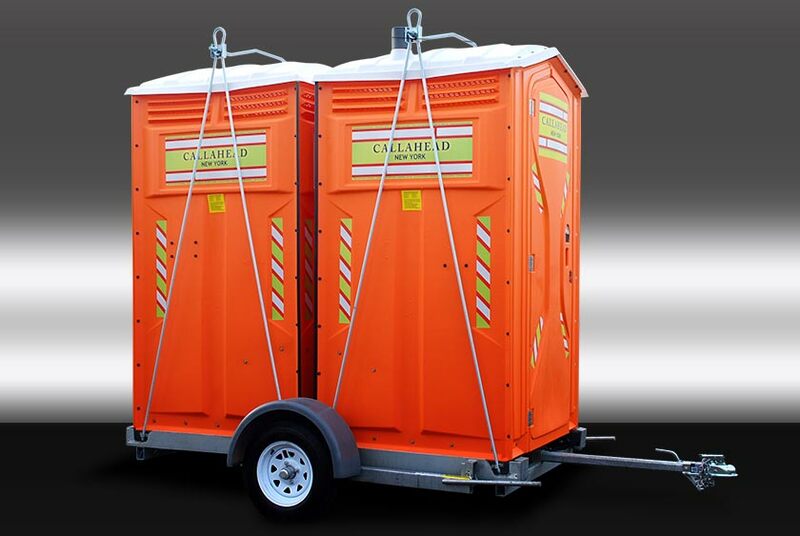 If you have any additional questions regarding design specifications please contact us at 1-800-634-2085 to speak with a CALLAHEAD portable toilet specialist. The DOUBLE SAFETY HEAD TRAILER is a CALLAHEAD design to deliver New York construction sites sanitary restrooms with protective design features to eliminate accidents at the job site while also being easily mobile all in one convenient rental. 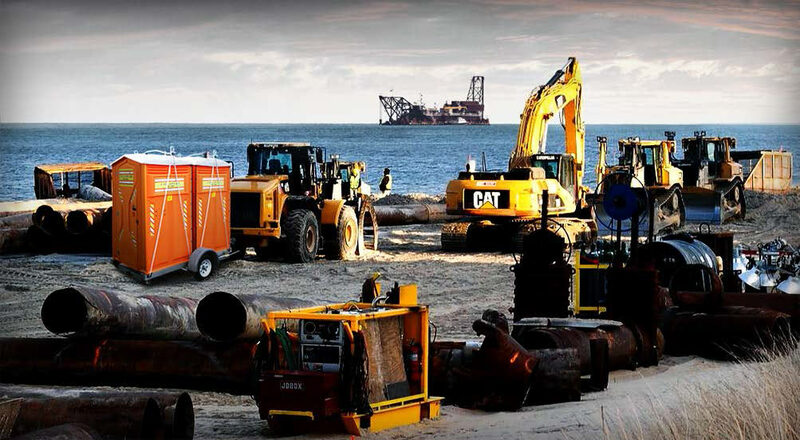 Since 1976 CALLAHEAD has consistently developed innovative ways to advance the industry with the best portable sanitation equipment in the world. 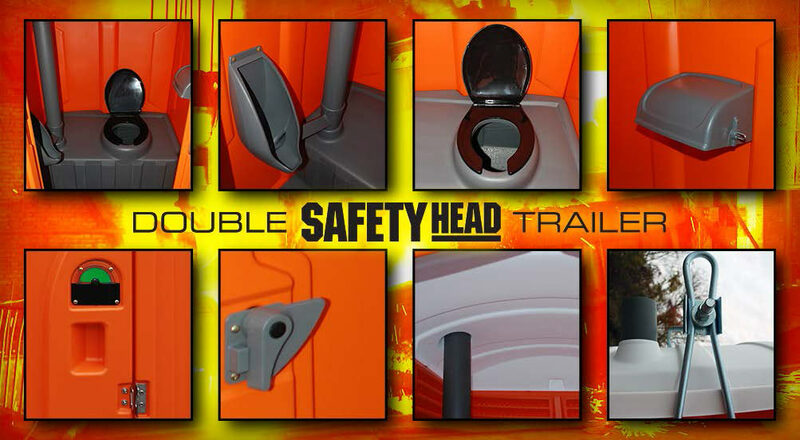 The DOUBLE SAFETY HEAD TRAILER combines two CALLAHEAD one-of-a-kind SAFETY HEAD portable toilets on a single trailer that was specially engineered to transport portable toilets. The DOUBLE SAFETY HEAD TRAILER was designed to stick out adding value to New York job sites. 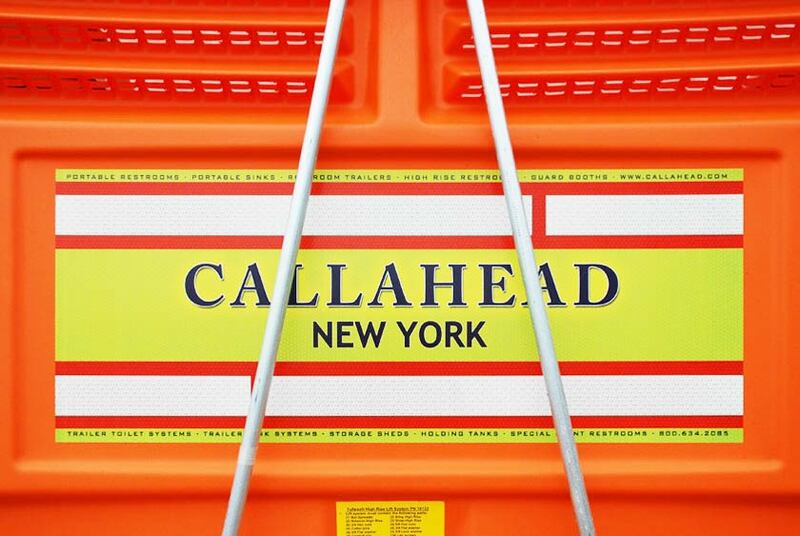 From its bright orange coloring, and its specially designed reflective CALLAHEAD New York signage, everyone will immediately take notice of the DOUBLE SAFETY HEAD TRAILER at the construction site. 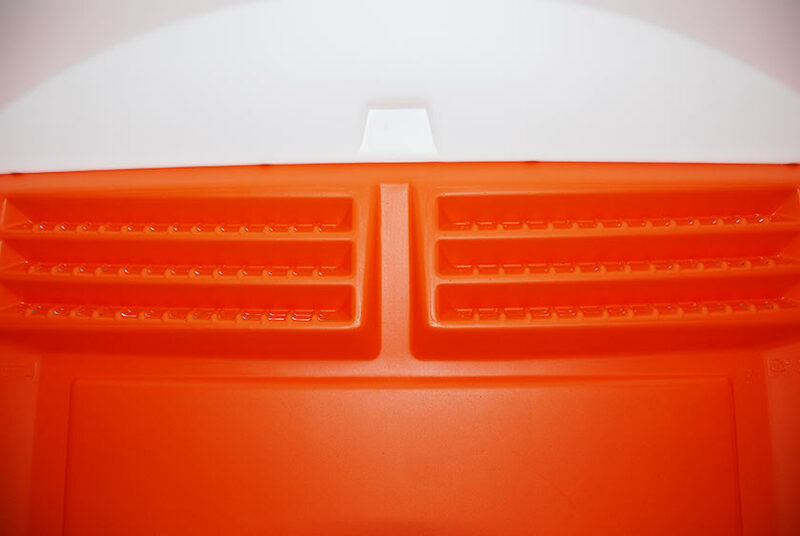 The bright orange exterior is designed with yellow, white and red safety reflectors to match job site safety equipment. 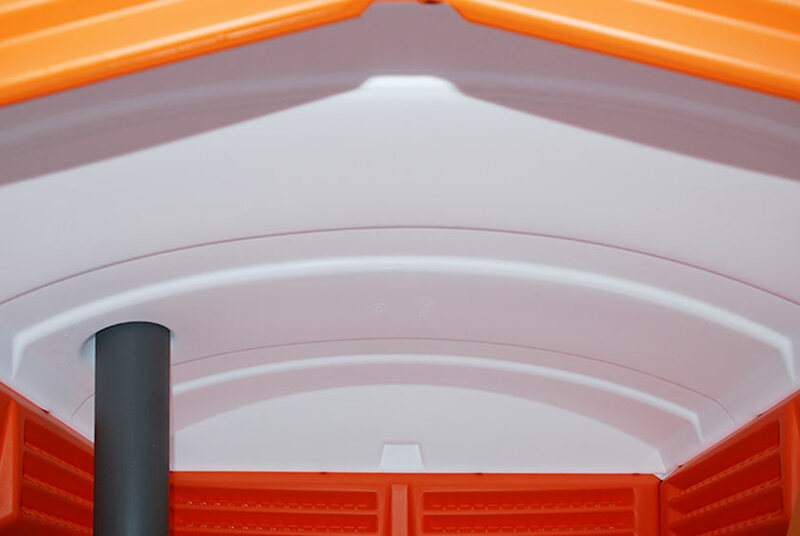 It delivers two clean porta potties that are easily mobile, and contribute to job site safety all in one rental. When you need two full-size portable toilets at highway, road, tunnel and bridge construction jobs, the DOUBLE SAFETY HEAD TRAILER is the ideal solution for these traveling construction jobs. 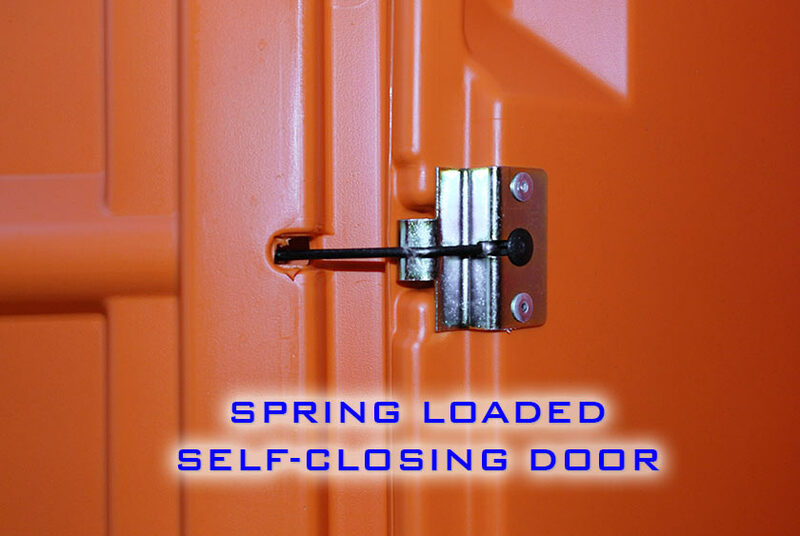 It is also the perfect long-term rental for locations that prevent access to flatbed trucks necessary to deliver portable toilets. 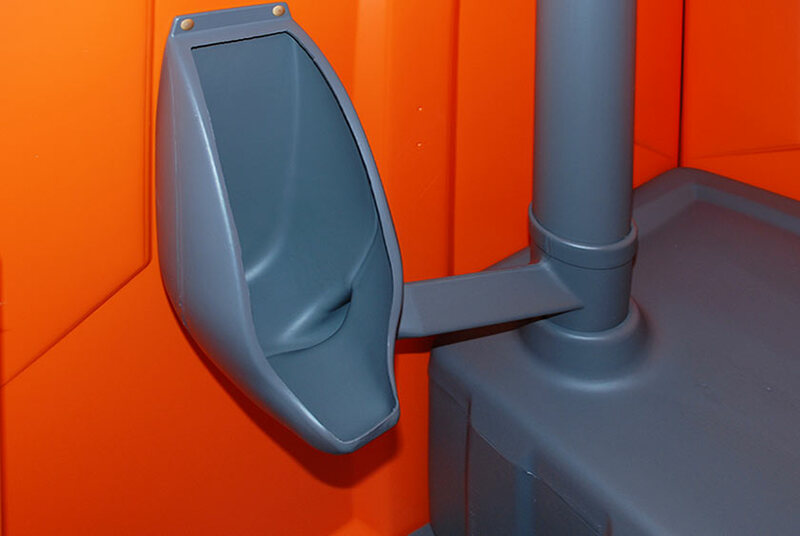 This limited access can make moving porta potties extremely difficult or even impossible. The DOUBLE SAFETY HEAD TRAILER will easily transport without any need of a flatbed truck. An excellent resolution for job sites that won't permit tank trucks for cleaning services too. The DOUBLE SAFETY HEAD TRAILER attaches to any small vehicle with a hitch and quickly transports the porta potties to your scheduled CALLAHEAD cleaning location. It can also connect to any smaller sized vehicle with a trailer hitch such as a garden tractor or golf cart too. 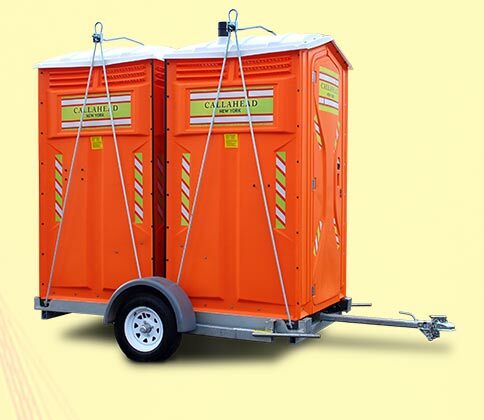 The DOUBLE SAFETY HEAD TRAILER equipped with two portable toilets constructed of high-density polyethylene. The portable toilets interiors are extremely spacious with a full sized comfortable toilet seat, and a filled covered toilet paper dispenser. The extra-large holding tanks can hold 70 gallons each. Separate non-splash urinals are located from the furthest point of the toilet seat away from user's direct site. 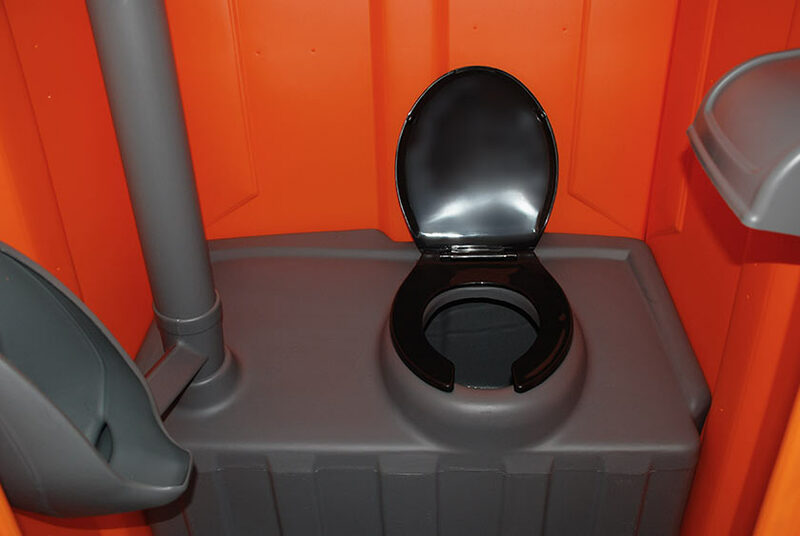 The portable toilet's steel gray smooth interior wipes easily clean and won't absorb any odors for maximum sanitation and comfort. The DOUBLE SAFETY HEAD TRAILER has lockable doors and displays exterior occupancy signs for privacy. Each restroom has a coat and hat hook on the interior door for convenience. Chimney stacks combined with floor and ceiling molded in wall vents quickly release odors and provides comfortable air flow inside the restrooms.